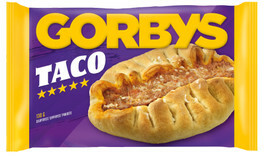 Bread with taco seasoned beef filling and cheese topping. Perfect snack! WHEAT flour, MILK, beef, onion, sweet corn, rapeseed oil, tomato purée, CRÈME FRAICHE, spices (incl. Cumin, pepper, garlic, oregano), CHEESE, modified WHEAT starch, broth of beef (beef, salt), sugar, white wine vinegar, yeast, salt, dextrose. Meat content 14% May contain traces of egg.